There are 65 corpsmen assigned to 1st Battalion, 5th Marines, in Sangin, Afghanistan, the majority of whom are on their first deployments, and it’s the nature of the beast that many will have seen their first casualties on the battlefield on this rotation. The corpsmen in this picture, Hospital Corpsman 2nd Class Alberto Cisneros and Hospital Corpsman 2nd Class Richard Erfurth, are two of the more experienced corpsmen at the 1/5 Battalion Aid Station. 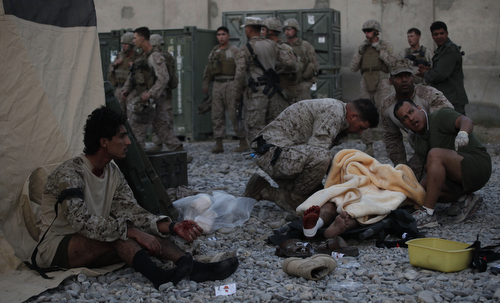 They are treating Afghan soldiers wounded Sept. 8 in a bombing near FOB Jackson, the 1/5 headquarters in Sangin. I met them when I was there in July. As Cisneros told me, there is a first time when every corpsman finds out just how hard it is to see a wounded Marine fighting for his life. Unfortunately, the bad guys in this area have planted thousands of bombs in the ground where Marines from 1/5 go on patrol. The grunts find a lot of the bombs but sometimes the bombs find them first and these corpsmen have had to deal with multiple amputations. To keep things light, their humor can be dark. Take Hospital Corpsman 3rd Class David Smith. He’s on his first deployment and seems to have quickly realized how dark humor can keep it real. He changed the lyrics to “Your Love” by The Outfield and, using his rifle as a stand-in guitar, sang it for me as I videotaped him at the aid station. It made everyone laugh, but still underscored the raw reality, the dangers he and every Marine face when walking around in Sangin. That’s dark humor? That explains why people don’t always enjoy my jokes! usually articles a few really exciting things like this. If you’re new to this website. Thank you to everyone out there doing what you have been trained to do. My son, Brett MaronBrown, is a new Naval Corpsman. He is also an Emergency Frist Responder x’s 3yrs and a Medical Assistant x’s 2yrs. Most of all he is a Martail Artist, TaeKwonDo, holding a level 3, 3rd degree blackbelt (one more test and he will get his 4th degree). All of you inspire him to be the best he can be and he is hoping to be able to go out and sere where he is needed, in battle. Prayers for all and God Bless!